About 9 o'clock on the evening of Wednesday, the 2nd July, an explosion occurred in the Ell coal workings of No. 1 pit, Blantyre Colliery, when 31 persons were in the pit. Four of them were got out alive within eight hours of the accident; two others were found alive, but died before they could be brought to the surface ; the remaining 25 were all found dead. Twenty-one of the bodies were got out on Thursday forenoon, and the remaining four on Friday before 4 o'clock a.m. One of the survivors has since died, so that out of the 31 men who were in the pit at the time, 28 are dead and three survive. Blantyre Colliery belongs to Messrs. William Dixon (Limited). It is a large colliery, and employs 660 men underground ; 500 of these work during the day, and 160 at night prepare the workings for those who work during the day. The colliery is throughout lighted with safety lamps - not the ordinary Scotch safety lamps, but Davy and Clanny lamps - with the exception of the naked lights which are at the bottom of the downcast shafts and at the lamp station within 100 yards of the respective shafts. No. 1 pit has been working since 1872. It is sunk to the Main coal seam, which is 129 1/2 fathoms from the surface. This seam was worked by the long-wall method, but the workings were abandoned in November last, and have been built off by brick walls. A current of air passes along the front of these buildings and reached the upcast without encountering any other workings. The present workings are confined to the Ell coal, which lies about 12 fathoms above the Main coal, and in them were 100 men during the day and 30 men during the night. They were commenced in 1873, and extend northwards and southwards from the shaft. The north workings extend 900 yards from the shaft. They have been worked partly by the "stoop-and-room" and partly by the long-wall method, and a few of the stoop-and-room places were in operation. At a point 440 yards from the shaft part of the workings are shut off by brick dams, backed by 30 yards of stowage ; a 2" pipe is inserted in the building and permits the passage of any gas from the inside. With the exception of those bricked off, the north side workings were all accessible and ventilated. The south workings extend 770 yards from the shaft, and have also been worked partly by stoop-and-room and partly by long-wall. All the stoop-and-room workings are standing. The long-wall workings are situated at the extreme south of the stoop-and-room workings, and are reached by the south level. They extend over an area of six to eight acres. The seam is about five feet thick, and the roads are formed every 15 yards. The four feet of stone lying immediately above the coal is blasted down in the roads to afford height for drawing the coals when the roof subsides, and the stones are used for building the sides of the roads. These side walls are about 12 feet in thickness, so that there is a vacancy of about four yards until the collapse of the roof closes up the void. The "level"is the main road, and out of it branch four headings, Nos. 1, 2, 3, and 4, to the west, and near to the face of the level a dip branch or "dook" to the east. Each of these headings has branches off it into the face of the coal. There was no blasting in the coal, but it was permitted in the stonework or "brushing," under the 8th general rule, a fireman being appointed to light the shots. The following were the arrangements for ventilation: The air descended No. 1 pit and split north and south at the Ell coal seam. Eight thousand cubic feet per minute passed into the north side workings, and after sweeping along the face of the stoppings which shut off the waste and the unoccupied workings, passed into No. 5, the upcast shaft. Thirteen to fourteen thousand cubic feet per minute was sent into the south level till it reached the long-wall workings, through which it was guided by doors and screens to the face of the dook and the level, and thence round the rise in one current, returning by the rise level through the stoop-and-room waste till it joined the air from the north side and passed into the upcast. This was the regular routine of work. Fire-damp was only reported once during the last three months, when it was reported on the 19th May in the No. 2 heading. The owners state that they took every precaution to prevent pipes, tobacco, or matches being taken into the workings, or the lamps being tampered with; and several prosecutions have been instituted against persons for breach of these rules, the last case being on the 1st instant, the day preceding the accident, when John McLean, miner, was tried before Sheriff Spens, at Hamilton, and fined 40s. for opening his safety lamp. The first appearance of the explosion was observed by the pit-head man of No. 1 pit, who heard a sharp report, and saw a little dust coming up the shaft and a slight movement of the cage. He immediately ran for John White, the oversman, who lives within 150 yards, and before half-past nine White was at the shaft. He sent the empty cage down the shaft, but, finding that it stuck fast about the Ell coal, proceeded down the No. 3 pit, and found that the men there were not aware of the accident. He and others who had then gathered went through the communication to No. 1 shaft. Shortly afterwards they were joined by Mr. Watson, the certificated manager, and steps were at once taken to ascertain the seat of the explosion and to rescue the men in the pit who were known to be all in the south side workings. Parties were also sent down to the Main coal, which was found undisturbed, also into the north workings of the Ell coal, and to the "dams." They found the brickwork of the overcast within 20 yards of the shaft damaged, but there was no disturbance of the workings, or of the dams. The whole force was then concentrated on the south Workings. The first man reached was the lamp-trimmer; he was found in the lamp-station alive and able to explain that he was in the cabin at the time, and that the blast came inwards upon him. He was severely injured, and died before he could be taken up the shaft. The lamp-cabin was demolished, and a pony found alive near the stables was burned. An attempt was made to pass into the level, and a point about 350 yards from the shaft was reached without seeing any other person. All the brick stoppings on the side of the level road were blown out. The roof was considerably fallen at various points, and the after-damp was so strong that they could reach no further. They at once set about putting in temporary stoppings of canvas in place of the brick stoppings. About 12 o'clock Mr. Thomas, the general manager, arrived. About 3 o'clock Mr. Watson, Mr. White, and others penetrated as far as the long-wall workings, and passing several bodies lying on the level road, reached five living men at the head of the dook. One of these died while being carried out, but the other four were got out about 4 o'clock. By this time Mr. Robson, the Assistant Inspector of Mines, had arrived and descended the shaft, and with Mr. Thomas and an exploring party reached the level face and passed round the faces to the second heading, where they were stopped by after-damp before they could explore No. 1 heading. About half-past four Mr. Charles Thomson, one of the partners of the Company, and Mr. Moore, descended the shaft and passed into the workings. The air was very strongly impregnated with after-damp, but parties were able to recover all the bodies but four which were supposed to be in No. 1 heading. The stoppings were now overhauled, and about 11 o'clock another unsuccessful attempt was made to reach No. 1 heading, but no further progress could be made, and it was then decided, seeing that there was no likelihood of the four persons being alive, to put in better stoppings to improve the ventilation. Men were at once set to this, and before 4 o'clock on Friday morning No. 1 heading was explored, and the four bodies found and sent to the surface. Subsequent examinations of the workings showed that the effects of the explosion were mainly visible in the south level and the long-wall workings, where the men were engaged in it. There were many falls of roof in the level road, and all the 18 stoppings were blown out in a westerly direction. The lamp-cabin was demolished; and the lamp-station was also destroyed. The first dead body was found 42 yards from the shaft; it was burned, and so were the next three between that point and No. 1 heading. Of the whole number, 12 were burned, some slightly; the others died from choke-damp. The three survivors were not burned at all. The men who were found alive were those nearest to the face of the level. They say that they were present when the lamps were, examined, locked, and given out that night. They also state that when the explosion occurred six of them were working within a short distance of each other; two of them were at the face of the level, two at the face of the dook, and two in the first branch to the left of the dook. They were all knocked over by the blast, and all of them with the exception of Owen thought it proceeded from a shot. Owen thought it was an explosion. It put out all their lights, but, being within cry of each other, they met at the top of the dook, where they were ultimately found by the explorers. On reaching this place they held a consultation, and sat about 20 minutes, when they considered it advisable to try to reach the shaft. After passing 20 yards outwards, they got amongst hot after-damp, and returned to the same place. A second attempt was unsuccessful, so they again returned to the head of the dook, when one by one they became unconscious until recovered by the explorers. They state that they never heard any sounds from the others. With the exception of some screens and doors being blown down, there was no destruction in the long-wall workings. Five shots had been fired that night, and, judging from the appearance of the debris, some of them had been fired very shortly before the explosion. In the second heading the explorers found a quantity of fire-damp at the face, and it still remains, probably owing to the ventilation not being in its normal state. All the safety lamps have not been accounted for. One was found unlocked, but in good condition. On searching the clothes of the deceased, and especially those working near to where the gas was found, some pipes and tobacco were found ; indeed from appearances they had been smoking. A pipe half filled with tobacco was found in one of their hands ; on others lamp-keys, matches, and pipes were found, proving that they had paid little attention to the special rules which forbid these things being taken into the workings. The workings and waste are all accessible, and have been travelled since the explosion. There are no traces of burning on the props, or any appearance of dust having been on fire either at the face or in any part of the pit. From all appearances the explosion has originated about the rise workings of the long-wall, and passed down one of the headings, and out the level, without touching the survivors, who were left unscathed, and the air in that neighbourhood unaltered. In passing outwards the flame appears to have burned the men, and gained force as it passed through the narrow throat of the level and reached the bottom of the shaft. 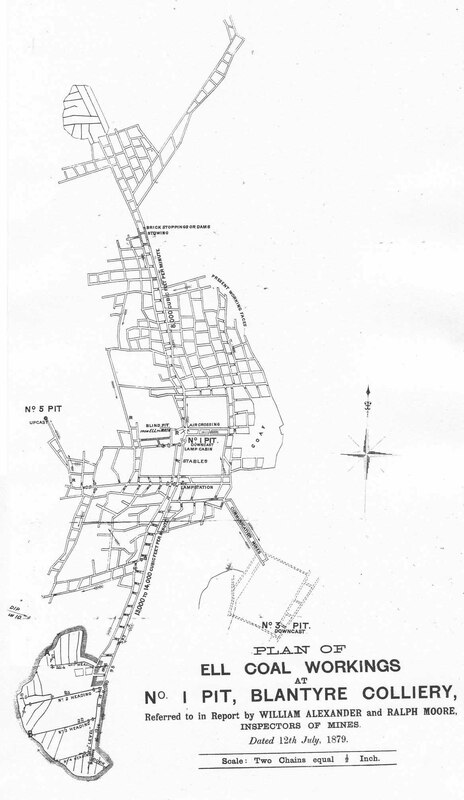 Appended is a tracing from the colliery plan upon which are shown the places where the bodies were found, and the districts affected by the explosion. The bodies nearest the supposed point of ignition were not burned, but this by no means indicates that they did not ignite the gas, as it often happens that the person igniting the gas is unburned, the flame extending in the direction of the incoming air. 1. That the arrangements for the ventilation of this pit were sufficient, and that the quantity of air sent in was ample under ordinary conditions. 2. That the explosion was an explosion of fire-damp. 3. That owing to some abnormal condition there had been at the time of the explosion an accumulation of fire-damp of comparatively small extent, and that the explosion originated somewhere between A and B on plan. 4. That while locked safety lamps were handed out to the men, some of them had keys, tobacco pipes, and matches, and notably those near the point P had been smoking at the moment of the explosion. 5. That the gas was not ignited at a shot. 6. That up to the time of the explosion five shots had been fired, and in particular one or two of them near where we believe the gas may have existed, and that some of these shots may have had the effect of displacing the gas, and bringing it in contact with an open light which there is too much reason to suppose existed at or near the point F.
High Blantyre is gaining an unenviable notoriety in the annals of mining catastrophes. Scarcely two years have elapsed, the date being the 22d October 1877, since an explosion occurred in No. 2 pit, High Blantyre, belonging to Messrs Dixon & Co., by which over two hundred men lost their lives, and on Wednesday night a similar accident happened in the adjoining pit, known as No. 1, which has resulted in the death of twenty seven men and the serious injury of six others. Like the disaster in October 1877, the origin of the explosion is shrouded in mystery, and those who alone could throw any light on the sad affair no longer live. The cause therefore of the accident must be left very much to speculation, even those who might be supposed to form some correct idea as to its cause professing their utter ignorance on this point. The scene of the accident was so fully described at the time of the former explosion that little requires to be said on that point now. The group of pits known as Nos. 1, 2, and 3, belonging to the Messrs Dixon, lie quite near the village of High Blantyre. They are situated very close to each other, and a working connection exists between them. The explosion in 1877 occurred in No. 2 pit, the one nearest the village, but on this occasion the accident happened in No. 1, which stands in a position almost midway between Nos. 2 and 3 shafts, but a little more to the north. The pit communicates directly with No. 3, although the one is not dependent on the other for an air supply. So far as can be ascertained, the regular miners left off work about four o'clock on Wednesday afternoon, when everything seemed to be going all right below. Two hours afterwards thirty one men descended. They were mostly what are termed “brushers” - that is, men employed to clear the roadways and make preparations for the colliers starting work in the morning. The duties of a brusher in a mine of a fiery nature are always of a somewhat precarious character. He has often a good deal of blasting to do with gunpowder in making a way for the hutches, and generally performing a class of work which requires some explosive in its accomplishment. Blasting, indeed, for this class of work is allowed under the Mines Regulation Act, because its prohibition, until some other method of working is discovered, would practically bring operations to a standstill. As a rule, the brushers are usually experienced miners, and there is no reason to question that this remark applies to the ill-fated men who have lost their lives in the No. 1 pit. For three hours after they descended the mine everything seems to have gone right, but at a quarter past nine o'clock on Wednesday night James Bennett, the engineman, and Alexander M'Millan, the pitheadman at No. 1 colliery, were startled by a loud rumbling noise proceeding from the shaft, which resembled, according to the engineman, the sharp detonation of a charge of dynamite. Following almost instantaneously on this report, the bells communicating with the ell seam and the pithead rang violently, while the wire ropes attached to the cage rattled against the wooden lining of the shaft. The cause of all this commotion was only too apparent, and if there had been any doubts they were soon set at rest by a volume of smoke issuing from the mouth of the shaft. The engineman and pitheadman had scarcely time to do anything when some of the officials from the office, and a number of miners from the houses three or four hundred yards to the south west, attracted by the noise, rushed to the pit. The engineman had the presence of mind to lower the cage, in case any of the poor follows below might have found their way to the pit bottom but after going down a certain distance the cage would not work, which indicated that the force of the explosion in coming up had damaged the slides. Fortunately No.3 pit, lying to the north east, was not affected by the explosion and an exploring party was speedily organised to go down and work their way along to No. 1 pit, in the hope of rendering assistance in the event of any of the men being alive. Mr Watson, the manager of the collieries, who, it may be remembered, got himself severely burned at the explosion in 1877, volunteered to lead, and he was accompanied by Mr Robson assistant manager, Mr James Watson, jun., and the following oversmen and firemen:- James Torrance, W. Gilchrist, John Pickering, John White, Watt Howieson, and Thomas Laidlaw. For a portion of the way the explorers had few difficulties to contend with, but as they neared the bottom of No. 1 shaft their progress was stopped. The force of the explosion had destroyed the bratticing, and they had to renew this in order to bring the air with them as they went along. But the men were too impatient to render aid to their fellows in the mine to spend much time in renewing the bratticing as carefully as should have been done, and as they pierced farther into No. 1, the air became so vitiated that, as one of the party said, “the fire damp stood before us like a wall.” Mr Watson, however, as leader of the party, pressed onwards, and getting in amongst the after damp, he became insensible and fell down. White, the day oversman who followed, lifted him in his arms, and carried him about twenty yards, but he, too, had inhaled the poisonous air, and he also dropped down insensible. In this terrible plight the rest of the partly, at great personal risk, succeeded in rescuing Mr Watson and Mr White, and before doing anything further they had them conveyed to the pit bottom and sent up the shaft, where every means were used to restore consciousness. Watson and White were afterwards taken to their homes, and attended by Drs Grant and Marshall but it was several hours before they regained consciousness..Meanwhile the news of the explosion was conveyed to the police office, and early in the morning Sheriff Birnie, of Hamilton and Mr Dykes, the Procurator Fiscal, as well as Mr Ralph Moore, the Government Inspector and Mr Robson, his assistant, arrived at the scene of the explosion. After the accident to Mr Watson and Mr White, one or two additions were made to the exploring party, which again descended with the intention of finding the bodies On the second occasion more care was bestowed to repairing the air courses, as it was quite evident access could not be obtained to the mine otherwise, owing to the large accumulation of after-damp. The construction of the bratticing was by no means an easy process, owing to the falls which had taken place in the roadways; and after proceeding some distance into the working the explorers had to retire owing to the presence of fire damp, A mark was made at the place where they left off, and on returning shortly afterwards it was found that the foul air had increased in volume, and they could not reach their former point. By this time all hope was nearly abandoned as to the safety of any of the men in the mine, but the explorers worked none the less diligently on this account, for they had the feeling that some of the brushers might have escaped the violence of the explosion, and were possibly still alive, and fortunately this turned out to be the case. Shortly after midnight the explorers got to the main level road of the ell seam in No.1 pit, where the brushers were known to be working, the scene of wreckage presented, although very considerable, was of course nothing like that which took place at the former explosion in the adjoining pit. Still the falls from the roof and the defective ventilation made it requisite that great caution should be observed in carrying on the explorations. By three o'clock Mr Ralph Moore, his assistant, M Robson, Mr Charles Thomson, the general manager of Messrs Dixon's pits, Mr Thomas, and Mr James Addie, of Langloan went down the mine to superintend operations and these gentlemen, by their practical skill, did a good deal to assist the explorers. About five o'clock in the morning, the heroic fellows, who had been working hard, at considerable risk themselves, came upon some of the men about eight hundred yards from the bottom of No.1 shaft. At the first look it was thought they were all dead, but on closer examination 1ife was found not to be extinct. Amongst the men to be brought up alive was Charles Lafferty who seems to have made a wonderful escape. Then the explorers came upon John Newton roadsman, who was also alive, but so much injured that he died while being sent up in the cage. The other men who were got out alive were Bernard Cairn, Bernard O'Neill, and James Owens. Cairns and O'Neill were very badly injured, and it was deemed advisable by the doctors not to take them further than the engine house, where they lay most of the day unable to speak. Late in the evening, O'Neill had so far recovered that he was able to speak, and he was conveyed to his house, but Cairns still remained unconscious. As the only man who was able to give any account of what took place in the mine after the explosion, Lafferty's story is worth repeating in his own words. He said, "I was working along with my father and another man on the main level road of the ell seam of No; 1 pit last night. My father left about nine o'clock to visit another part of the working. I heard a few minutes afterwards a sharp crack that went echoing through the pit. I cried to my companion “That's an explosion!” and extinguished my lamp - an example which he immediately followed. The report appeared to me to come from the waste working on the north side of the pit. My companion and I turned to run in the direction of the shaft. I had not proceeded far when I was propelled to the roof by the force of the explosion. I rebounded from the roof to the side wall and then 1anded on the floor. I was rather stunned and very much bruised, but, picking myself up ran for dear life. For a time my companion who had also been knocked down by the shock, kept beside me, but after the “glaff” passed, he appeared to be affected by the foul air, and, giving a cry, he fell down. I continued to scramble along until I was tripped by some bodies that lay across my path Falling forward on my face I lost consciousness. I did not regain the use of my senses until I was taken up to the engine room. My injuries, which consist almost entirely of cuts and bruises having been dressed by a doctor, I was sent home. I was afterwards told that my father had lost his life in the disaster.” Owens, another of the saved, said he heard the sound of the explosion, and made an effort to reach the shaft. When he got within about 800 yards, he fell on his face and lost consciousness. On coming to himself sometime afterwards, he was lying in the engine house, and his injuries, which consist of burning in the region of the chest, were being attended to by a medical man. Both Lafferty and Owens were found lying side by side with the bodies of most of these who were killed, and the supposition is that in making their way to the shaft they came in contact with those who had been nearer the force of the explosion than themselves. The raising of the bodies of the dead to the surface was got through very quickly, and by one o'clock twenty three corpses were at the pit head. The bodies were covered with a waterproof sheet in coming up the cage. When they were taken to the surface the faces were washed in an apartment set apart for the purpose ; they were then placed in coffins, and parties who had missing relatives allowed to see them for identification. Dr Grant and Dr Marshall say that while a great many of the bodies were badly burned and disfigured, most of the men had died from the effects of choke damp. The medical gentlemen attribute the escape of those who are alive to the fact that they had fallen with their faces to the bottom of the pit, and thus escaped the fall effect of the choke-damp. James Owens (52), a widower. Peter Berry, married, leaves a widow and six children. Patrick M'Garvey (35), married, leaves a widow and six children. John Malone (38) married, leaves a widow and five children. John O'Neill (32), married, leaves a widow and three children. John M'Guigan (33), married, leaves a widow and two children. Bernard O'Brien (38), widower, and one child. Patrick Macgrubbin (58), married, leaves widow and child, who are living in Parkhead. Alex. M'Arthur (40), married, and resided at Springburn. John Harvey (44), unmarried, lately come from Partick. James Lafferty, fireman (46), married, leaves widow and grown up family. Thomas Irvine (60), married, leaves widow and grown up family. James Bryson (58), married, leaves widow and grown up family. Richard Run (30), married, leaves widow and six children. Edward Thomson (31), married, leaves widow and three children. The whole of the above resided in Dixon's Rows, or in the neighbourhood of the pits, with one or two exceptions. 1. Peter Berry; 2, Patrick M'Garvey; 3, John Malone; 4, John Newton. ; 5, Robert Millan; 6, John O'Neil; 7, John Murphy: 8, Tague Boyle; 9, Edward Jardine; 10, Bernard O'Brien; 11, Michael Howat; 12, Patrick Ballely; 13, Patrick M'Grubbin; 14 Alex. M'Arthur; 15, John Harvey; 16, Edward M'Garvey; 17, James Lafferty; 18,Thomas Irvine 19, James Bryson; 20, Richard Run; 21 Alex. Symington; 22, John Wilson; and 23, Edward Thomson. It is thought that there are other four men still in the pit viz., John M'Guigan, Henry Duffy, Patrick Lynch, and Thomas Macduff. The condition of the atmosphere in the mine when the earlier parties of explorers descended does not, it is feared, leave room for the slightest hope that any of them will be taken out alive. Only one loop hole through which comfort can make its way exists. It is thought that some of them may have emerged before the explosion, but this means of escape from a lamentable conclusion cannot be regarded as very satisfactory, because if any of them had been saved in this way news of such a deliverance would most probably have been speedily reported to those in charge. The four men who were injured in the accident - namely, Bernard Cairns ; Charles Lafferty, Bernard O'Neil, and James Owens - were somewhat better by night, as were also the two suffocated by the after damp in the subsequent search - Mr Watson and Mr White. It may be mentioned that at the time of the explosion there were in all about 170 men in the three collieries, of which No. 1 occupies a central place ; but those in the other pits were not only not affected by the explosion, but they were ignorant of its occurrence until informed by some workmen who came down. A boy named Charles M'Millan, residing at Barnhill, made a miraculous escape. He came up the mine about two minutes before the explosion, and had scarcely left the pithead when he heard the rumbling noise. As previously stated, the cause of the explosion is a mystery. The locality even where it originated seems to be unknown even to the engineers. An inspection of the workings, however, leaves no doubt that wherever the gas came from, or however it was ignited, the force of the explosion spent itself in the main road of the Ell Seam, to the south of the shaft. The force of the explosion appears to have been very great in the vicinity of the bottom of the shaft, and for two or three hundred yards along the “laich” level, while comparatively little damage has been done to the working places off the main road. The mine is now wrought on the long wall system, although the stoop and room system was at one time followed, and it appears that to the north of the shaft there are some waste workings where it is possible gas may have accumulated. In trying to come to any conclusion as to the origin of the accident the difficulty has to be faced that none but Davy's patent safety lamps were in use in the mine, and it is believed that even where gas is present it will not explode at the Davy lamp, unless through the very grossest carelessness. It would be uncharitable to assume that any of the poor men who have lost their lives contributed to the accident by their neglect of the roles, but it is impossible to shut out of view the case tried before the Sheriff at Hamilton only the other day, where in the No. 2 pit, a man actually opened his lamp in the mine by means of a nail. The lamps are all locked before being given to the miners, but it is well known that some of the workmen twist nails in such a way that they can open the lock. The engineers say they are unable to give any theory as to the cause or whereabouts of the explosion until a more minute examination has been made of the workings. Some of the miners seem to favour the idea that the gas had either come from the waste workings to the north of the shaft, or that some large “blower” had suddenly opened, and the gas, in travelling in the direction of the shaft, ignited at the paraffin lamps kept at the bottom to afford more light than can be procured from safety lamps. After igniting, they think the gas had run along the main road for some distance, and hence the circumstance that the workings away to the extreme south of the shaft are uninjured. This theory, of course, must be taken for what it is worth. It must not be forgotten that a considerable portion of the duty of the brushers is to blast, and there is every reason to believe that blasting operations were being carried out on Wednesday night. At the present time it would be unsafe to say that the explosion was due to blasting, although those who know the dangers attending this operation will be inclined to look to that as a not unlikely cause until some other explanation is put forward. The No. 1 pit, it seems, has by no means a bad reputation as a fiery mine, the miners speaking very highly of it in this respect. The streets of the village presented a most melancholy aspect in the gloaming, as carts, having ghastly loads of coffins only half concealed by the mats thrown over them, jolted to their destinations, and as women, mourning aloud the loss of their bread winners, would not be comforted. During the night the principal topic of conversation among the motley groups that gathered around the huge fires in the great iron braziers at the pit head was the cause of the disaster, and although many theories were advanced, a decided opinion could not be said to be formed on any of them.